Dr Heinrich Medicus, Troy, New York (acquired from the above sale). O.J. Brendel, Etruscan Art, New Haven, 1978. N. Thompson De Grummond, A Guide to Etruscan Mirrors, Tallahassee, FL, 1982. 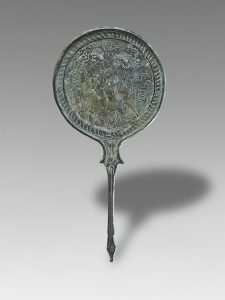 Hand mirrors are among the most informative visual sources for imparting information about ancient Etruscan mythology, religion, and civilization. Mirrors were designed to be held by a long handle, while utilizing a highly-polished circular surface for reflection. The reverse of the disk was usually finely incised with depictions of myths and deities – most often relating to stories or figures embodying physical beauty. Sometimes, the engraved scenes would portray scenes of marriage, with wedding preparations, embracing couples or women at their toilette. It is thought, therefore, that mirrors were commonly gifted as part of a bride’s dowry. An appropriate subject for a mirror, a woman’s personal beautification ritual was the purpose and context of the mirror itself. The mirror came to be a symbol of wealth and social status to be treasured by women of aristocratic ranks, who would proudly use the precious mirror in their daily lives and would count it among the most prized possessions carried with them into their tombs. Hand mirrors were popular among the Etruscans especially from the sixth to first centuries BC. The shape and decorative details evolved through the centuries. By the fourth century, the design came into the form of the present example, with the handle cast together with the disk, often terminating in the head of a ram or hind, as here, which was known as a symbol of femininity. The scenes engraved on the reverse of the disk were usually framed by a border of laurel, ivy vine, myrtle, or guilloche, as on the present example. Among the favorite myths depicted on Etruscan mirrors were several subjects of Greek or Etruscan mythology, or a mixture of the two, that were often noted with identifying inscriptions bearing the Etruscan names of the characters, including The Judgement of Paris, Zeus and Ganymede, images of Aphrodite, Adonis, and Helen of Troy, and others. The composition on the present example is a gathering of four figures, often described as a Sacra Conversazione, an art historical term borrowed from Italian Renaissance paintings. To the far right and left are the Dioscuri, the twins Castor and Pollux, identifiable by their Phrygian caps. Between them are a male a female, both facing left. The female is likely to be either the goddess Aphrodite (Turan to the Etruscans) or Helen, the sister of Castor and Pollux, who is perhaps paired here with Paris. Each figure is magnificently presented with varying volumes of cascading drapery that fill the space between them. The three figures to the right all face left and lift their right hands in gesture toward the left most figure, one of the Dioscuri, who stands in a relaxed pose, leaning on a column. 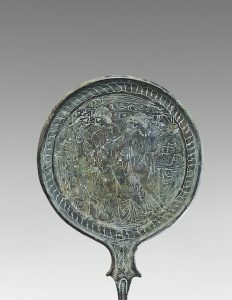 The ancient Etruscan mirror was a feat of engineering, allowing for reflective assistance in primarily female cosmetic application and beautification. Its decorative elements, with scenes of mythology as well as daily life, have become equally reflective windows to the past, teaching our modern eye and scholarship the nuances and intricacies of the elusive and mysterious Etruscan people.